LOGAN-ROGERSVILLE—The Wildcats rolled unbeaten through the COVC-Small last year, and return three starters from last year’s 19-8 conference champions. Rogersville lost All-State and COC-Small Player of the Year Corbin Medley to graduation, yet may be better this season than they were a year ago. The Wildcats are led by a trio of All-Conference selections, including senior Ben Vinyard and the junior backcourt of Christian Brown and Marcus Gorman. MARSHFIELD—The Jays finished with an up-and-down 16-13 record, but that included a district championship. Marshfield will miss the leadership and production of Blayne Armstrong, who signed to play quarterback at Missouri State, but the Jays return four starters from last year’s team that went 4-2 in the conference. Seniors Lukas Clift, Bradey Welsh, point guard Josh Powell, Seth Lumley will lead the way, along with junior Wyatt Findley. BOLIVAR—The Liberators won two different tournaments last season, including an impressive win over eventual Class 4 state runner-up Helias to win the Bolivar tournament. Still, the Liberators’ inconsistency resulted in a 15-11 overall record. The Liberators must replace three starters lost to graduation, including a pair of 1st-Team All-Conference players in Chance Rash and Coday Garrison. There is plenty of talent left in the program, though, led by junior guard Bryce Krueger and emerging sophomore big man Brandon Emmert. REEDS SPRING—Three starters return from last year’s 7-16 team that won just one COC game. The Wolves will rely heavily on one of those starters, an All-Conference honoree in 6’3” senior Josh Kent. In addition, junior Jarod Cole will play a big role for Reeds Spring, as will sophomore Joel Gertson, who starter last year as a freshman. HOLLISTER—The Tigers finished 18-9 under first-year head coach Ryan Worley last season, including a 3-3 conference record. 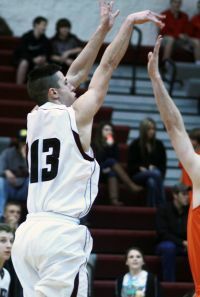 However, four starters were lost to graduation, including the Tigers’ All-Conference leading scorer, Blake Woods. The only returning starter is a good one, though, in 6’6” Ethan Davidson. In addition, look for Tony Simonetti to have a breakout season this year in an expanded role. SPRINGFIELD CATHOLIC—The Irish posted a 12-13 record last season, and then graduated their entire starting lineup, plus a key reserve. Though only four lettermen return, the Irish may be more skilled than last year’s lineup. However, Catholic will be very inexperienced. Seniors Jack Kerr, 6’4” Lucas Gatten and Will Wester, as well as junior Leighton Youngblood, will lead the way for Hall of Fame head coach Tony Armstrong. BUFFALO—The past few seasons have been forgettable for the Bison, who will now welcome in a new coach in Eric Ingram. Buffalo will be extremely young, with only five upperclassmen on the roster. The Bison will use this rebuilding season to focus on the future, with some talented younger players coming up through the system. Christian Brown, Logan-Rogersville—After transferring from Spokane prior to last season, Brown earned 2nd-Team All-Conference honors after averaging 13.2 points and making 51 three-pointers last year. The 6’2” junior should lead the Wildcats in scoring this season, and should be one of the top players in the entire area. Lukas Clift, Marshfield—As a junior last season, Clift averaged 16 points and 7.6 rebounds per game, earning 2nd-Team All-Conference and All-District honors for his efforts. The 6’4” senior should be the Jays’ go-to option this season. 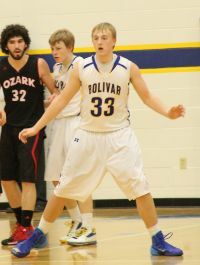 Brandon Emmert, Bolivar—The big and burly Emmert averaged 11 points and eight rebounds as a freshman last year. The 6’6” sophomore has a full season under his belt, and should have a breakout season as one of the conference’s best big men. 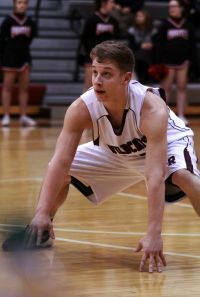 Marcus Gorman, Logan-Rogersville—Gorman earned 2nd-Team All-Conference honors after averaging 7.8 points and 5.3 assists from his point guard spot. This will be the third season starting at point guard for Gorman, who has a pass-first mentality but is not afraid to look for his own shot. Josh Kent, Reeds Spring—The speedy Kent was named 2nd-Team All-Conference last year after posting averages of 15 points and 8.2 rebounds per outing. The senior, who was also named All-District last year, is a standout athlete and a potential game changer on both ends of the floor. Ethan Davidson, Hollister—The Tigers return just one starter this season in Davidson, a 6’6” senior who averaged 10 points, 5.5 rebounds and 1.6 assists last year. Davidson is a big, strong and athletic big man who can take over a game in the paint. Lucas Gatten, Springfield Catholic—The Irish lost all five starters to graduation, but do return Gatten, a 6’4” post player who started six games a year ago. Gatten bulked up in the offseason, and is ready to bang in the paint as one of Catholic’s top scoring options. Bryce Krueger, Bolivar—This 5’11” junior has been contributing for the Liberators since he first arrived as a freshman. One of two returning starters for Bolivar, Krueger averaged 11 points and three assists per game last season and is ready to take on more prominent scoring and leadership roles for the Liberators. Bradey Welsh, Marshfield—A three-year starter, Welsh has unlimited range from the outside, and made 67 three-pointers last year. The 6’1” All-District senior sharpshooter averaged 9.4 points and 2.1 steals per contest as a junior. 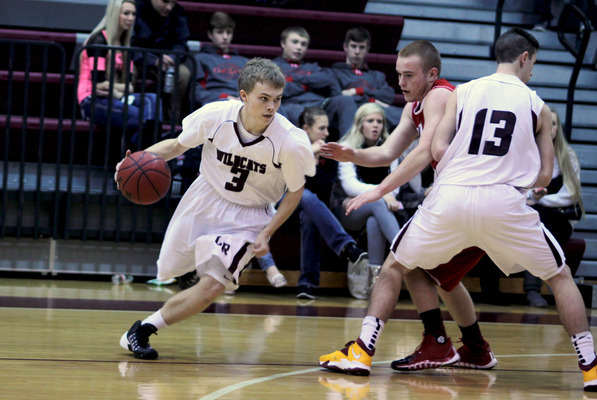 Ben Vinyard, Logan-Rogersville—An honorable mention All-Conference honoree last year, Vinyard will do the dirty work in the paint for the Wildcats, and is not afraid to mix it up a little. The 6’3” senior averaged eight points and four rebounds per game as a junior. Gino Gallo, Buffalo—One of just two players back for Buffalo with any significant varsity experience, the 5’8” Gallo averaged four points and two rebounds as a junior last year. 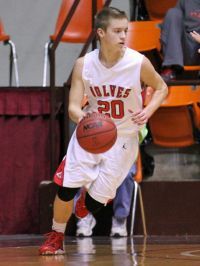 Joel Gertson, Reeds Spring—Gertson started at point guard as a freshman last year, averaging 4.2 points per game for the Wolves. Gertson is a great ball handler and is working on becoming a solid all-around player for Reeds Spring on both ends of the floor. Jack Kerr, Springfield Catholic—Kerr started six games last season, and will need to take a step forward in production for the Irish this season. The 5’8” guard is a heady player who understands the game well. Seth Lumley, Marshfield—Arguably the most athletic player on the Marshfield roster, Lumley has the ability to lock down an opponent’s best player. Look for an expanded role this year for the 6’2” senior. Johnny Scott, Bolivar—One of the most versatile players in the conference, the athletic Scott can guard all five positions for the Liberators. The 6’1” junior needs to take the next step with his offensive game, though, in order to be one of the best all-around players in the area. Tony Simonetti, Hollister—Simonetti will need to make outside shots to keep defenses from sagging down low on big man Ethan Davidson. The 5’10” senior guard will draw the task of guarding the opposing team’s best player, and will use his speed to get to the basket, but needs to improve his finishing ability around the rim. (13) Logan-Rogersville v. St. Charles—The Wildcats get a perennial Class 4 power at the 3rd-Annual Ozark Mountain Shootout at Glendale. The Pirates have posted a 43-12 record the past two seasons, and should provide Rogersville with a stiff early season test. (16) Skyline at Buffalo—First of all, get there early for the girls game, featuring two of the area’s best players in Buffalo’s Morgan Henderson and the Lady Tigers’ Madisen Brethower. Then enjoy the fluid teamwork of the Skyline attack. The Tigers’ Dylan Mountain is one of the best all-around athletes in all of Southwest Missouri. (19) Logan-Rogersville at Glendale—The Wildcats visit Glendale for an important early season test. Coach Brian McTague has the Falcons flying in the right direction, and Glendale’s pressure defense should provide a good challenge for Christian Brown and Marcus Gorman. (26-30) Blue & Gold Tournament—Bolivar, Buffalo, Hollister, Logan-Rogersville, Marshfield, and Reeds Spring will represent the COC-Small in the annual four-day holiday extravaganza. Other teams participating include: Aurora, Ava, Bolivar, Branson, Buffalo, Camdenton, Central, Clever, Conway, Crane, Fair Grove, Glendale, Greenwood, Hartville, Hollister, Lebanon, Logan-Rogersville, Mansfield, Marion C. Early, Marshfield, Mt. Vernon, Mountain Gove, Nixa, Ozark, Reeds Spring, Republic, Skyline, Spokane, Strafford, West Plains, Willard, and Willow Springs. (2) Strafford at Springfield Catholic—Happy New Year to the Irish, who host a deep and talented Strafford ball club that finished in third-place in Class 3 last year. The Indians feature a nine-deep senior class that swarms opponents with athleticism and pressure. (8-10) Houlihan’s Irish Invitational—This is the first time for this event, which features a four-team round robin tournament that includes the Irish, plus Cape Girardeau Notre Dame, Duchesne out of St. Louis, and St. James Academy from Lenexa. Kan.
(9) Republic at Bolivar—The two-time defending Class 4 state champions head north for a key non-conference match-up. 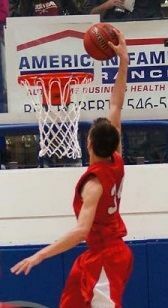 Can the Tigers stop 6’6” Bolivar big man Brandon Emmert? Can the Liberators solve the Republic riddle that has ruled Class 4 the past two seasons? (13) Bolivar at Marshfield—Conference play heats up with Bolivar’s trip to Marshfield. 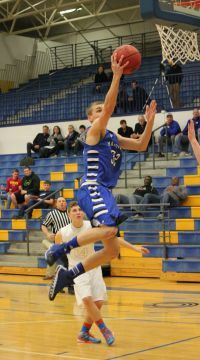 The Jays snapped a six-game losing streak to the Liberators with a win in the district opener last March. The winner of this one keeps pace with conference favorite Logan-Rogersville. (13) Nixa at Logan-Rogersville—The Wildcats step out of conference to host a perennial Class 5 power in Nixa, which features a pair of 6’7” twin towers in senior Jacob Ruder and junior Chase Allen. Rogersville has the advantage in the backcourt with Christian Brown and Marcus Gorman, but how the Wildcats handle the Eagles’ dominant frontline will be key. (16) Logan-Rogersville at Ozark—The Wildcats complete their tour of Christian County’s best with a trip to Ozark to face the Tigers, who have one of their best teams in years this season. Ozark’s Heath Carmichael and Chandler Lyon form one of the area’s best tandems. (16) Hollister at Bolivar—This match-up features the COC-Small’s two 6’6” big men: Hollister’s Ethan Davidson and Bolivar’s Brandon Emmert. (10) Springfield Catholic at Bolivar—Can the Liberators avenge one of their two conference losses from last season? (16) Springfield Catholic at Central—If you have never had a chance to see a game at The Pit, then make plans to see this game, as the Irish step out of conference to visit Central. (17) Marshfield at Central—Couldn’t make it to The Pit the night before? Here’s a second chance to visit The Pit, Central’s old school gymnasium, as Lukas Clift and company pay a visit. (20) Bolivar at Logan-Rogersville—Depending on how Marshfield factors into things, this could wind up being the de facto COC-Small title game. Regardless, these two teams have a history, which means the intensity will be through the roof, as both teams make final preparations for district play. (24) Logan-Rogersville at Marshfield—The Wildcats get their two hardest games to close out the season. Rogersville finished unbeaten in conference play a year ago. Can the Wildcats complete another unbeaten trek through the COC, or will the Jays be playing for a conference crown themselves. (26) Bolivar at Ozark—The Tigers are looking early on like one of the best teams in the Ozarks, which means the Liberators will have their hands full in the regular season finale for both teams.